Just a quick note — Gaela had seven puppies today. 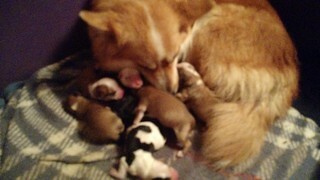 Mom and pups are all doing well. I don’t know sexes or anything yet. I’m not interfering right now. I want them all to bond well. She even had them in the whelping box. Go, Gaela! There are some flashy pups in this group! I can’t wait to meet them.